Ok. 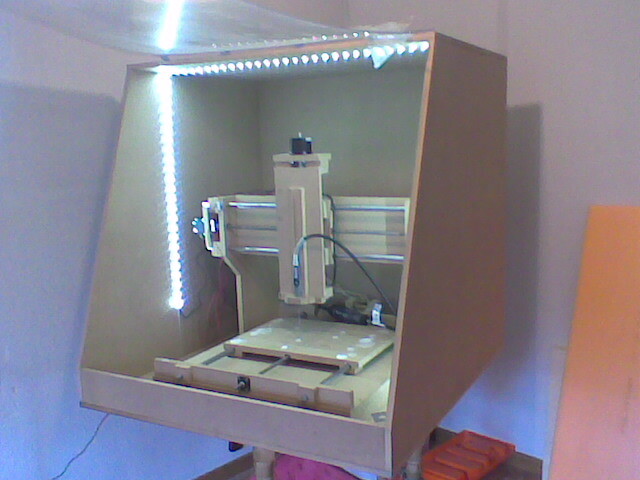 This is my CNC after my last days with it. I had some MDF boards cut to make a dust and noise cover, with a transparent plastic front… and yes, it works! Noise and dust are reduced to the point of making the CNC usable at home… I needed some light also, and while foraging for parts I came across that nice leds strip, which seemed to me like a good addition to the looks of the machine, but most of all, as a great light source to see anything inside the case. But I had to do something with the dust, still, cannot let it build up into the case. Here is my first simple approach: a handheld vacuum cleaner within the case (not visible in the photo). It worked for a while, but (i) the vacuum cleaner got clogged quite easily, and (ii) also got terribly hot. Next step will be drilling a hole in the case to get the vacuum tube out to an external (possibly homemade cyclone) extractor. I will also need to add some collecting device (brush, plastic strips…) to the tube holder to help direct the dust into the tube. Well, it really looks nice, doesn’t it… But still too slow for my needs… Maybe I should ask Santa for some new motors and leadscrews…. 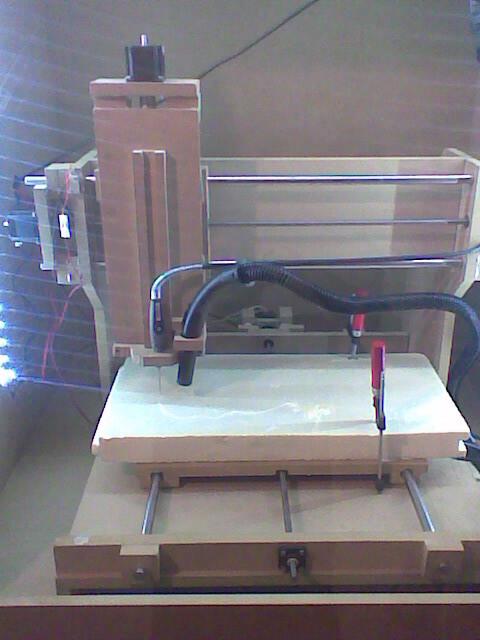 This entry was posted in cnc and tagged dust collection. Bookmark the permalink.